This morning I headed to the city of Spilimbergo, in the neighboring Friuli Region, for the start of Stage 13, which would take the riders into Austria to climb the Grossglockner. I looked forward to visiting a city and area where I’ve never been. My first stop was to get my press pass at the Gazzetta dello Sport bus. Waiting in line was none other than Giuliano Calore, “the cyclist of the impossible,” known for his ascents and descents of the Stelvio on a bike with no handlebars or brakes. In spite of his fame, he wasn’t having much luck convincing the pass people to give him a multi-day pass instead of a one-day pass that he’d have to wait in line for each day. I was impressed with his calm, polite, genteel manner; there was no evidence of the “Don’t you know who I am? !” arrogance that someone of his fame and reputation might exhibit. I asked him if he had any new exploits in mind, and he replied that in July he will descend the Stelvio at night! Pass in hand, I headed for the start village, where sponsors and local entities dole out schwag and dispense goodies at their stands, and many of the riders come to relax and have a coffee after signing in. I noted what must be the effect of the economic crisis: compared to past years there were fewer stands, practically no schwag, and not much to drink or munch. I had a chat with Eros Poli, an ex-pro from Verona most famous for his unlikely victory on the stage of the 1994 Tour de France which featured the climb of Mount Ventoux. Soon after, Michele Scarponi wheeled up to one of the stands and had a seat, wearing his usual friendly, rather mischievous smile, and looking relaxed. He was followed by scores of other riders, including Nibali, Viconti, and the maglia rosa himself, Alberto Contador. Everywhere you looked, cameras were snapping and pens and various articles were being thrust at riders for their autographs. Then it was time for the riders to line up, not easy for them with all the fans crowding about. I found myself standing next to Denis Menchov, who should win a prize for the most taciturn and unsmiling rider; my questions to him received one-word answers. After the race departed, I wandered around the lovely little city, glad that the Giro had brought me to a place I probably would not have gone otherwise. I ran into my friends Holly and Jeff, who impress me every year with their self-planned trips to the Giro. They book hotels, map out routes, follow the race, find prime viewing spots on the climbs, and on occasions even meet, chat, and ride with the pros. We said goodbye and I drove off towards the mountains, looking forward to seeing some new territory. I intended to stop for lunch somewhere, but the area was quite uninhabited and eateries were few and far between. I arrived at the top of the Passo Sant’Osvaldo, expecting to find a bar or trattoria, but there was only a forlorn little sign announcing the summit of the pass. I’ve never been on such a desolate pass! On the other hand, I liked being in such an unspoiled, non-touristy area. Finally, I saw in the distance a forest-covered mountain whose lower slopes had broken loose and slid into the valley below, leaving a huge M-shaped scar. I knew exactly what it was–as does every person in Italy. Even if you knew nothing of its tragic history, the strange, desolate landscape would fill you with dread, because it’s clear that something catastrophic had occurred here. One word says it all: Vajont. 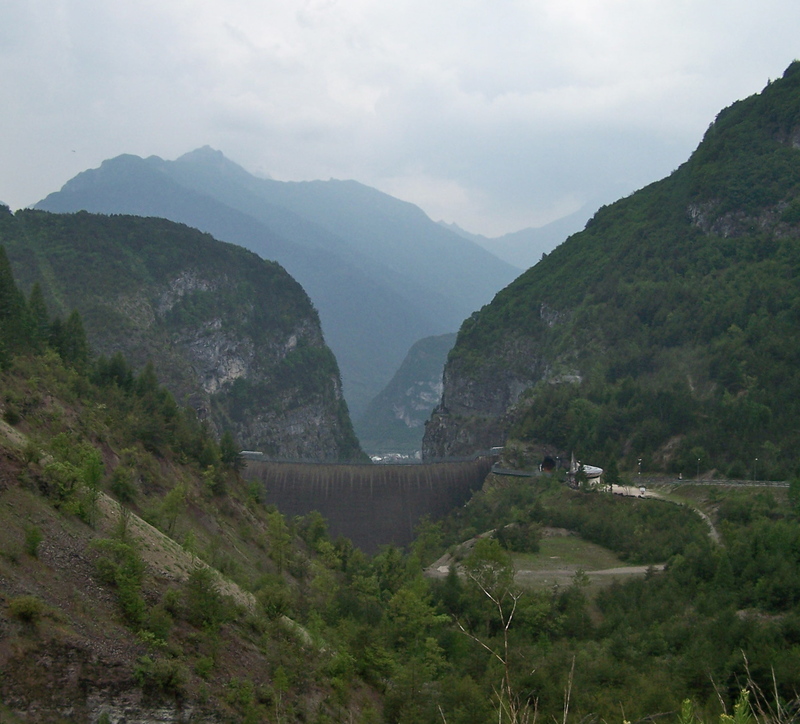 The Vajont is a stream which was dammed to create a reservoir for generating hydroelectric power. What did it matter that a number of engineers advised against building the dam because the mountain above it, Monte Toc, showed signs of surface fractures and instability–a fact that was known even by the locals. This was postwar Italy and there was building to do and fortunes to be made! The Vajont dam was going to be the tallest in the world. And built it was. But when engineers began to fill the reservoir, ominous signs warned of what was to come. Still, they paid no heed. On the night of October 9, 1963, 270 million cubic meters of rock and earth dislodged from Monte Toc and slid into the lake behind the dam. The water first surged up the opposite side of the valley, damaging homes and villages, and then, pulled by gravity, headed downward. Channeled into the narrow rocky passageway between the walls of the valley, it pushed before it an air blast more powerful than the Hiroshima atomic bomb, then cascaded over the dam in a 600-foot high wave, which bore down on the town of Longarone and annihilated it. Almost 2000 people lost their lives; entire families were destroyed. This was not a natural disaster. The fault was that of the engineers and construction company, who disregarded clear warning signs. The dam still stands as a monument to greed, arrogance, and total disregard for the lives and welfare of fellow humans. 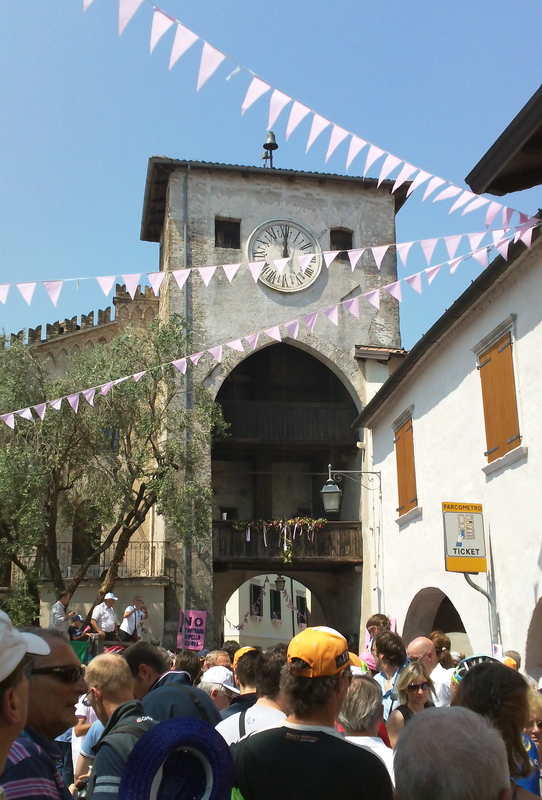 The 2013 Giro d’Italia will mark the 50th anniversary of the tragedy by dedicating a stage to the memory of the victims.